Several survivors of the 9/11 attacks and representatives of those killed brought a federal complaint against Saudi Arabia and Iran, alleging that the latter knew about the attacks and helped plan and coordinate them. 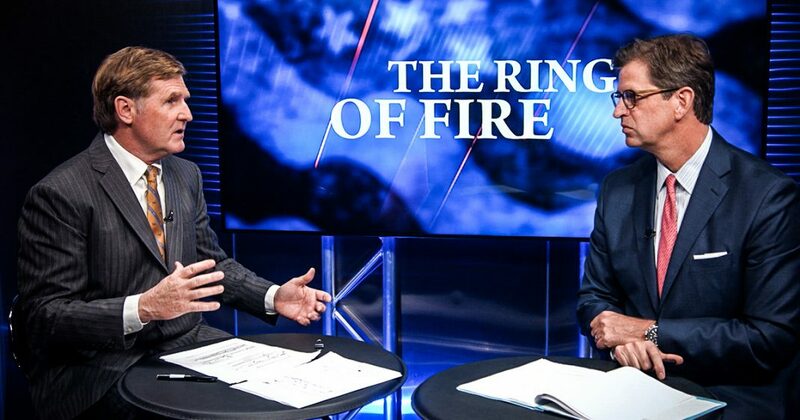 Ring of Fire’s Mike Papantonio and Peter Mougey discuss this. Peter Mougey:	You can’t make this stuff up. Mike Papantonio:	No. This is right from the transcripts. Several survivors of the 911 attacks, and the representatives of those killed, brought a federal complaint against Saudi Arabia and Iran, which is a little different, alleging that Iran knew about the attacks and helped plan and coordinate them. Now, as we’ve talked about on this show, no question, Saudi Arabia participated. Saudi Arabia prince, the family, the royal family, financed it. The family knew what was happening. Most of the people involved in it were Saudi Arabian nationals. Obviously, Saudi Arabia, you can sue Saudi Arabia. Now, because of JASTA … JASTA is a law that was passed by both sides. Both Democrats and Republicans jumped on this opportunity to pass a law that says, “We ought to be able to sue Saudi Arabia if they’re involved in terrorist attacks.” Before JASTA, the only way you could sue a country was to say that they were on a terrorist list. That came from the Foreign Sovereign Immunity’s Act, and you can sue them that way. Iran, now, is back in it. Tell us what the theory of the case is. Peter Mougey:	There’s a couple of different fact patterns that lead to liability for Iran. One is that there was a pathway, essentially, from Iran to Afghanistan for 8 of the 11 hijackers. They went from Iran, Afghanistan, and back and forth, and their passports weren’t being stamped. It was easier to get back and forth. That came from the higher ups in the Iranian government that helped facilitate the bombing and helped train the bombers, the attackers. Mike Papantonio:	Really, they also found records. Peter Mougey:	That’s the next step. Peter Mougey:	It was hijacking commercial planes and running them into buildings in DC and New York. That was part of the contingency plan. It was all laid out in documents that were found when they killed Osama Bin Laden in his compound, and it all went back to Iran. This lawsuit is rolling back the immunities and protections that we gave and gives a pathway to recovery. Peter Mougey:	That’s where you hit them. Peter Mougey:	You know what I like about this line of cases, though, that you’re seeing, and the bank cases that you guys are doing on the terrorist side is it’s very similar to the model used by your friend Morris Dees in Alabama. It is, if you can’t necessarily go after the conduct, go after the money. Hit the bottom line. Grab the money. Mike Papantonio:	Dry up the money. Peter Mougey:	Dry up the money, make it difficult, and just evaporate the tools, the money. By going after the assets, I think you’re really going to see more than some of the military conduct that ebbs and flows back and forth from the middle east. You’re going to see them hitting the bottom line. You’re going to see it making it more and more difficult for them to act. Mike Papantonio:	You had several banks in the UK and the United States that already plead guilty. Nobody went to prison, but they plead guilty to, “Yes, we did wash money for terrorist groups,” billions of dollars worth of terrorist group money. The point is, what people don’t understand … They ask, “Well, how do you tie it up?” Well, we have forensic people that can say the money originated with this person, maybe in the royal family. The money then went to UBS, wherever it might’ve gone. UBS washes the money. Then, the way it gets to the street is everybody … Take Al-Qaeda, for example, you think Al-Qaeda is one organization, but it’s actually a series of org- It’s like the Crips and the Bloods. Crips own 42nd Street. Bloods own 50th Street. The same thing happens with these terrorist organizations. The forensic types are able to follow the money all the way down to the street. They’re able to find out, where did the money go from the bank? What bomb maker did it go to? Where’s the area that the bomb maker operated in? They can draft it down right to the point to where the explosion takes place. You can’t do it with 100% certainty, but you can do it with what they call within a reasonable degree of forensic probability. That’s really all you have to get. You have get passed that threshold. Was there a reasonable degree of forensic probability that the money that was initiated with the royal family, there in Saudi Arabia, or in Iran? It initiated there, went to the bank, and then ended up on the street after [crosstalk 00:05:51]. Peter Mougey:	After a series of transactions. Mike Papantonio:	After a series of transactions. Peter Mougey:	This is really sophisticated. Boom, boom, boom, boom, boom.